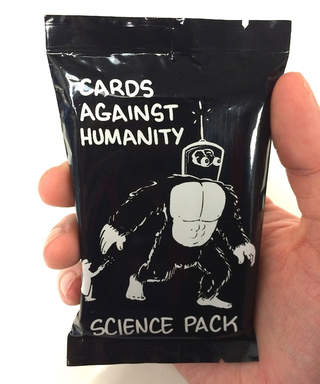 Cards Against Humanity is getting a dose of Science, Right Now! Beloved card game for despicably minded people Cards Against Humanity took to the Bay Area Science Festival Last week with a new pack of cards laden with Science-themed hilarity - and if you're impatient to play with them, you can even download them right now. Oh, there's such scientific naughtiness to be found within. If you're hankering for some Science-CAH though, you don't have to wait until next year to try them out - the full set of black and white cards, formatted to be printed on 3" x 5" index cards, is available to download right now! Rejoice, and enjoy creating some truly awful scientific sentences.